Este sumo nasceu por causa de um pacotinho de polpa de abacaxi congelada que estava há imenso tempo no congelador sem destino. A forma mais simples de lhe dar uso era mesmo fazer um sumo! I came up with this juice because of a packet of frozen pineapple pulp that was lost in the freezer for a long time with no destination. The simplest way to use it was making a juice! Place the frozen pineapple pulp and the mint in a blender and blend until the pineapple crushed, then add the sparkling water and blend a bit more until everything is combined. 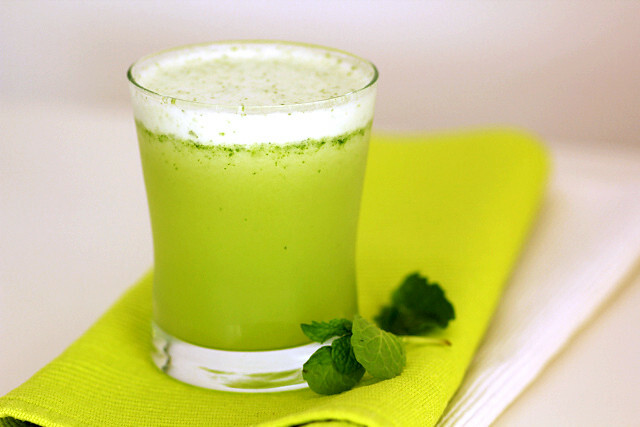 wow..beautiful greenish drink.. I love the pineapple and minth combination.. very smoothing..
Adorei o teu site.Just wonderfull!! As fotos , as receitas e todo o site em si.Já está no smeus favoritos para n perder pitada do que se passa aqui.